Ride the Rockies cyclists follow a course through a few of southern Colorado's signature attractions last summer, including the Colorado National Monument. Race organizers are hoping to route the ride through Aspen this summer. 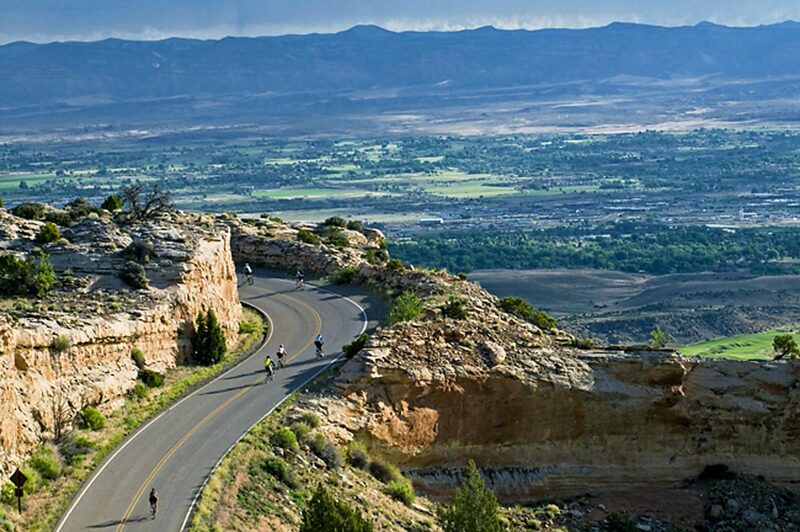 Grand Junction is slated to be the start city for Ride the Rockies again this year June 13-15 — the sixth time since 1986. It’s the 30th anniversary of the event; and for the first time ever, the community of Fruita plans to welcome cyclists and their cheering squad, too. According to Mike Bennett, Fruita’s city manager, to convince event organizers to alter the route, Fruita had to demonstrate commitment to the cyclists. Plus Fruita’s involvement with Ride the Rockies is vital to the community’s promotion of cycling. The partnership between the city of Fruita, Grand Junction Visitor and Convention Bureau and Fruita Chamber has been great, Bennett added. In years past, the route took riders to the frontage road near the Kokopelli business district as they exited Colorado National Monument. This year Fruita wanted to bring racers into its downtown area in hopes of attracting more tourism business and to show people the allure of small-town living. “The opportunity to welcome 2,000 cyclists — and about 750 friends and family who travel with them — to the community, and to sell them breakfast [and] lunch, and most importantly to showcase our community in a way that leads to their future choice to visit or relocate to Fruita has a pretty high value,” Bennett said. Fruita’s plans include a downtown Super-Aide Station, an information booth at Civic Center Memorial Park to direct riders to area attractions and eateries, a supervised bike corral provided by Colorado Backcountry, free massages from Colorado Canyons Hospital, and a bike-fitting station. The James Williams Brothers Band will perform from noon to 2 p.m. at the pavilion. As the community coordinating agency for Ride the Rockies, the Grand Junction Visitor and Convention Bureau (GJVCB) plays the most important role in facilitating a successful event for all of Mesa County. It reached out to the city of Fruita and was able to outline a favorable route for Ride the Rockies cyclists. The base camp for Ride the Rockies is Colorado Mesa University, which also hosted the event in 2010. Dana Nunn, director of media relations for CMU, said the university is giving out gift bags, providing food and entertainment, as well as both camping sites and rooms in residence halls. There will also be a beer garden and vendor expo. The event begins Saturday, June 13, with registration, the expo and entertainment at CMU. There is no ride that day, and the public is invited to the festivities at no charge. Sunday, riders will make their way over Colorado National Monument and into Fruita. Downtown Grand Junction will also have free entertainment, open to the public from 4-8 p.m. on Main Street. Cyclists will leave CMU Monday morning for Palisade and up Grand Mesa. “This is a community event, and we encourage everyone to come out and enjoy it, whether they come on campus or watch the riders on their route through the Grand Valley,” Nunn said. Volunteers are needed, and those interested can visit http://www.volunteersignup.org/BC3AX. For more information about Ride the Rockies, visit http://ridetherockies.com or find it on Facebook.